Creative Scrappers Sketch #299-Reveal Day!!! This month Creative Scrappers is teaming up with Cocoa Vanilla Studios!!! I used the Love Always Collection on my page... 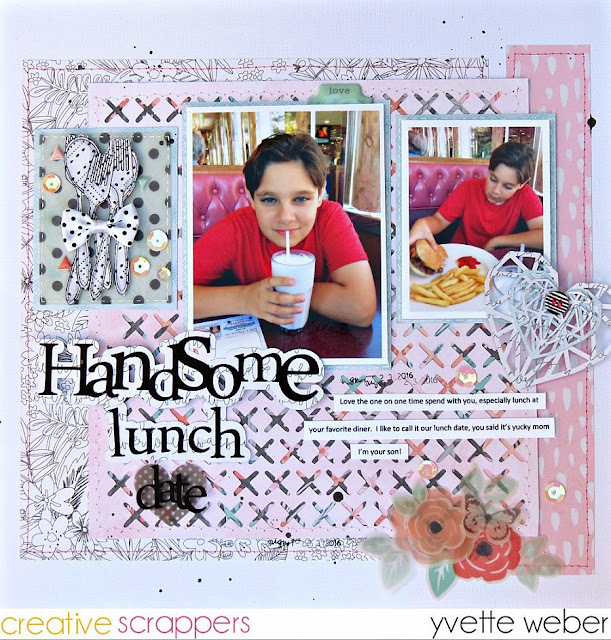 This collection is very soft and pretty, my first thought was to do a layout of myself, but decided to challenge myself to create a page of my son! Here's the awesome sketch that Kristine designed for us! Here's the layout I created!!! This layout features photos of my son Max, enjoy having lunch at his favorite Diner with his mom! I used two photos instead of four and added a panel to the third space. On this square I used a stamp with a fork and spoon design to add to the Diner feel, I then fussy cut, added a few foam dots underneath to add a little more dimension to my page. To finish off my page I added my title!!! To win a prize from Cocoa Vanilla Studio all you need to do is create a layout using sketch #299 and enter the challenge using our inlinkz widget at the bottom of this reveal on the Creative Scrappers Blog . The deadline to submit your layout is October 31st, a winner will be randomly pick!